Mangaluru, May 6, 2016: A native of Bhadrak district in Odisha and now in Manipal since eight years, Shaikh S.S. Shameem, 27-year-old assistant professor in computer applications at Manipal University has been stretching his horizons every since he took up endurance sporting three years ago. He is now aiming at entering the Limca Book of Records through his cycling expedition. He has planned an 8,000-km Kanyakumari-Kashmir (Leh)-Kanyakumari Atulya Bharat-Bharat Bhraman solo cycling expedition; from May 23 to June 29. After earning his masters in computer applications at Manipal, Shameem joined Manipal Institute of Technology as an Assistant Professor and has been active as an endurance athlete with the support from his institution as well. So far, he has taken part in 11 half-marathons, three full-marathons, eight 200-km brevets, four 300-km brevets and one 600-km brevet. Brevets De Randonneur Mondiaux (BRMs) are rides (bicycle) of fixed distances that are to be completed within specified time limits, having successfully passed through predetermined time controls. He not only concentrates on individual performance; but Shameem encourages others too. 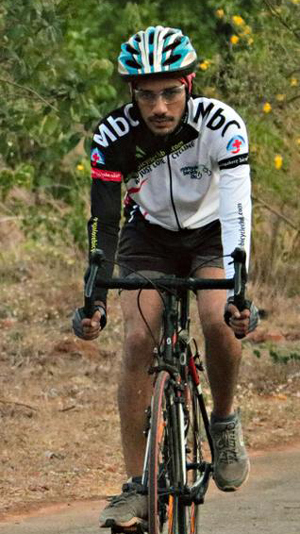 In the recently concluded 200-km Netravathi brevet organised by Mangalore Cycling Club, he rode along with four other riders from Manipal as a group from the beginning to the end encouraging and supporting them, though he could have completed the brevet much earlier. K2K Ride : Shameem told media that the double K2K ride is the first of its kind and till date no one has made an attempt to create a record. Apart from the zeal to create a national record, Shameem is keen on promoting cycling among the youth both as a fitness as well as commuting mode. Throughout his ride, he intends to mingle with local cycling clubs, youth associations and students to spread the message. Starting on May 23 in Kanyakumari, Shameem would reach Bengaluru on May 25 and June 26 (return); Hyderabad on May 28 and June 23; Agra on June 3 and June 18; Delhi on June 4 and June 7; and Leh on June 11 and 12. He would be back in Kanyakumari on June 29. Details on his ride are available onwww.ride4pride.weebly.com. He is also looking for support for the ride — financially as well as logistically; He may be contacted on Ph: 9538947416 or 7829069923 (Whatsapp). We are waiting to see your name in Limca book of records. Wsih you success. Its not an easy task.